I do not like spiders, but they do keep us from being over-run with pesky insects. 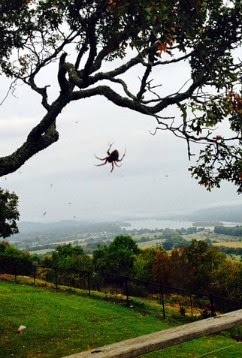 This industrious guy’s web reached all the way from an oak branch down to the barbecue grill. He’s welcome to keep all he catches as long as he dines outside. O Lord, how manifold are your works! I'm expecting to see some indoors looking for a warm spot now that the temps have fallen. I don't share my space inside so well. Stomp!